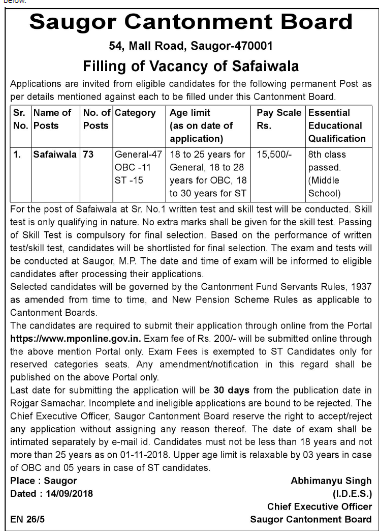 Candidates applying for Safaiwala Jobs must not exceed the upper of 25 years and below 18 years as reckoned on 01-01-2018. Candidates interested to join Sagar Cantonment Boards as Safai karamchari must have passed 8th class. ST category candidates are exempted from paying any application fee. Candidates intending to apply for Safaiwala Jobs will be assessed on the basis of Written Exam & Skill Test. 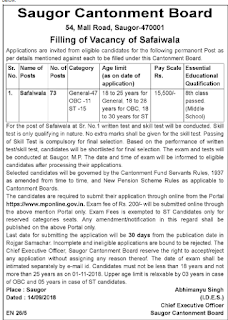 Candidates interested to join Cantonment Board of Sagar must apply online through the official website http://www.mponline.gov.in/ on or before 14th October 2018.